State of the State of Hockey: Round 2 - NHL Playoff Previews in five lines or less. Round 2 - NHL Playoff Previews in five lines or less. In my first round predictions I correctly picked 5 of the 8 winners. Better than even. However if you peek at the end toward predicting all rounds. I'd like to point out that both of my finalists are still in (unlike everyone that picked Pittsburgh and Vancouver), and three of my final four are still in. (Bruins let me down.) So I'm excited that I didn't buy into the Pittsburgh healthy and Vancouver has an awesome record hype. So short and to the point, here are my Round 2 predictions. I'll admit, I got a little nervous about picking the Blues to go all the way to the final after dropping game 1. But in the next four games, they shown they are as complete a team as there is in the West. I am thrilled for the Kings beating Vancouver. It may not have shown on the scoreboard, but the Kings showed a lot of hustle and outplayed the often lackadaisical Canucks. I don't imagine the Blues will be asleep at the switch the same way, but if the Kings put forth the effort and Quick is superhuman again, this could be very interesting. Phoenix definitely one their first round series mostly because of the massive mismatch between the pipes. As good as Mike Smith is, the Preds boast Veznia finalist Pekka Rinne on the other end and they are a deeper team in front. Despite not having "home-ice" I think the Preds will do just fine in this matchup. The Rangers were my pick before the playoffs started, but I have to be honest, they got outworked by Ottawa in a few games. This makes me rather nervous because they face a Washington team that seems to have found its stride at the end of the regular season, and squeaked out a series victory over Boston in gritty fashion. I'd really like to see if the Rangers can kick it into a better gear this serious, but I'm a little nervous for them, and I think they get pushed to the brink again. This is going to be another great series to watch. Should be hard hitting. But also, this could be a tough one on the goaltenders. For the Flyers, Bryzgolov and Bobrovsky were only marginally better than Penguins counterpart Marc-Andre Fleury. For the Devils of course Brodeur is a legend, but this is the Devils first appearance in round 2 since 2007, and therefore the longest his season has been since then. 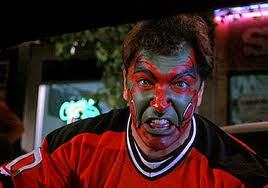 If he struggles this could get ugly for the Devils. On the other hand, if Philly's netminders underperform, we could see (yes I'm going to type this) a pretty high scoring Devils team. New York over St. Louis (sticking with it, despite my reservations about New York). Enjoy the playoffs, and I tend to tweet while watching games @SOTSOHockey if you care to chat.